Just in time for next week’s return of The Walking Dead, AMC is expanding the scope and content of its recently launched AMC Premiere subscription service, Vulture has learned. The ad-free version of AMC will offer subscribers advance access to scenes from the network’s signature zombie drama every week during the new season, starting Wednesday with the first three minutes of the October 22 season-eight premiere. What’s more, AMC Premiere will add its first non-AMC series on Saturday, when it begins offering ad-free episodes of the second season of BBC America’s sci-fi adventure Dirk Gently’s Holistic Detective Agency. And while AMC Premiere is currently only available to Comcast cable subscribers, AMC president Charlie Collier says that will change in the not-so-distant future as the network looks to seriously grow the service. 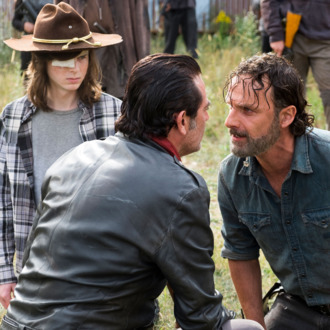 This month’s Walking Dead return represents a huge opportunity for AMC (and partner Comcast) to drive audiences to fork over the $5 monthly fee for AMC Premiere. The series is, far and away, the network’s most-watched show and arguably the biggest hit on all of television. So while AMC Premiere has already offered substantial bonus content for other network series that have aired since the premium tier launched in June, the TWD bonus content for Premiere will be the most extensive. Starting today, subscribers will be able to watch the first half of the 14-minute TWD original short Red Machete, with the second half bowing on Christmas Eve; regular AMC viewers will see the short unspool over two months as interstitials during ad breaks. Most Sunday nights, immediately after episodes wrap, AMC Premiere will show subscribers the cold open for the following week’s episode. (During the two weeks when producers have deemed the next week’s open too spoiler-y, Premiere will serve up an alternative exclusive preview.) And a pair of promotional documentaries tied to TWD will be made available on Premiere two days before both are available on the regular AMC channel. “We have really passionate fans who want to be engaged, and AMC Premiere lets us serve them in a really meaningful way,” Collier told Vulture. But while TWD will almost certainly be a significant driver of subscriber sign-ups for Premiere, Collier and AMC head of innovation Mac McKean say early data from the first three months of the service have shown some surprising results in terms of what kinds of programs do well on the premium platform. Per McKean, the AMC Revolutionary War drama Turn: Washington’s Spies, which was never a massive hit when it aired on the network, has “had a significant viewership on AMC Premiere.” The series skewed old when it was a linear series, something that’s not ideal for an ad-driven network like AMC, since advertisers pay a premium for younger audiences. “But subscription knows no demo,” McKean says. Because audiences “of all ages have pooled together” to watch Turn on Premiere, the series has become a “powerful” show for the service. AMC isn’t the only cable network looking to give audiences a Netflix-like, ad-free experience. Over the summer, FX unveiled FX+, which offers the same commercial-free environment for watching FX Networks programming, in addition to a broad array of FX library titles. FX+ also launched as a Comcast-only service, but has since become available to Cox Cable subscribers. Collier is also hinting at AMC Premiere expanding beyond Comcast, though he declined to get too specific about exactly when that will happen. “We’re talking to everybody,” he says, adding that more partnerships will be announced “over the next weeks and months.” About a month after it was announced as a Comcast Xfinity service, AMC and Comcast expanded AMC Premiere’s availability to the AMC mobile app and the network’s Roku channel.